Choice magazine's selected "Why Elections Fail" as one of the Outstanding Academic Titles in 2016. 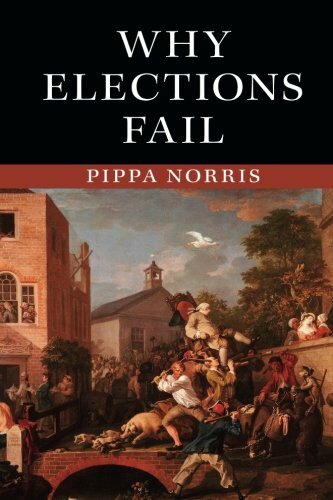 This second volume in the book trilogy written by Pippa Norris seeks to unpack the reasons why elections are undermined by numerous kinds of flaws and failures. Structural, international, and institutional accounts provide alternative theoretical perspectives seeking to explain general processes of democratization and these frameworks are adapted to develop insights into why elections may fail to meet international standards. The first perspective suggests that some problems are probably best explained by the challenging conditions and the societal constraints in which contemporary elections are attempted. An alternative argument focuses upon the international community’s attempts to uphold global norms, through monitoring elections, diplomatic pressures threatening or punishing regimes which violate standards, as well as the provision of technical assistance and development aid. By contrast to these predominant perspectives, this book focuses primarily upon institutional design, to explore the claim that the most effective interventions for strengthening contests involve the types of domestic constitutional, legal, and regulatory arrangements. The study concludes that insights into effective institutional designs should be firmly rooted in theories of consensus or power-sharing electoral governance. The essential aspect is rules to prevent winners from consolidating power through manipulating the electoral rules and processes. At the same time, electoral authorities need sufficient resources and capacities to prove effective when managing contests.